I’ve just recently come back to looking at my paternal grandmother and her family. When I first looked (many years ago) I was put off because all the names were the same and I found it difficult to unravel who was who. You see, Grandma was born a Macleod from the Isle of Lewis. I managed to trace back a couple of generations but then I got stuck. 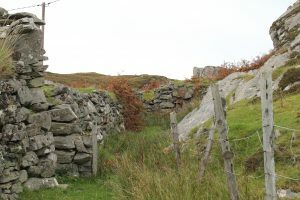 I knew her first language was Gaelic and that she was born in a blackhouse (the main picture shows one of these traditional houses at Gearrannan in Lewis). I had always wanted to visit the island so when the opportunity came up I jumped at it. I made contact with the local Historical Society for the area she was born in and arranged to meet the Chairman. After saying hello and welcome his next words stunned me – “there’s a couple of your cousins coming to meet you”. I’ve had practically no contact with any of this branch of my family so wondered who they were. When these cousins arrived, they asked “You’re Donnie’s daughter?” I am – and their questions sealed their connection to me. Only my grandmother’s family ever called my Dad that (his name was actually Daniel). One of these second cousins once removed then told me that she was now the tenant of the croft where my grandmother was born and offered to take us to visit. Now a shell, with no roof, it still gave me goosebumps. Suddenly I think I understand her more now too – even though she died more than 40 years ago. No research is ever complete but I have now found out a lot more about her and her ancestors. My 4 times great grandfather, (one of several Murdo’s in the tree), lived and worked in one of the remotest places on Lewis – accessible today only on foot or by boat. The family moved from there to another area only to find themselves “cleared” in 1871 and moved to where Grandma was born. I hadn’t known of the family’s brush with the clearances – I guess I’m lucky that they weren’t forcibly shipped to Canada or America like so many were. What I find amazing is that there are still family using that land today – for grazing sheep, if not to live on.